Wetness does not stop gruffness. Westerns are on their way back. People are once again curious when they see trailers for a new western. Apparently, people are able to forget the horror that was American Outlaws and Texas Rangers. Ron Howard, coming off his Oscar winning last film A Beuatiful Mind, chose a western to be his first project after the win. Cate Blanchett and Tommy Lee Jones were obliged to join him. The Missing is the result. Cate Blanchett plays a single mother named Maggie raising her two daughters (Evan Rachel Wood and Jenna Boyd) on a small piece of land. She's a makeshift doctor, evidenced early by her graphically pulling a diseased tooth out of an old Spanish woman. She employs two men to help her run the place, and she's mighty friendly with one of them (Aaron Eckhart). They seem to be in the middle of a loving, but closed off courtship. Then, in rides Trouble. And this time, Trouble has huge ears. 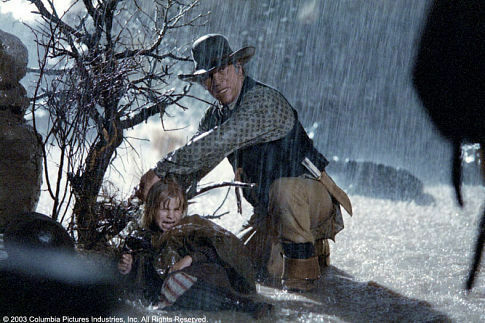 Maggie's estranged father Samuel, played by Tommy Lee Jones wants to see Maggie. There's an exchange that fleshes out the problem between the two during his examination by Maggie. It seems that he ran off some time ago when his kids were young. He joined an Indian tribe, married one of the tribespeople, and went on living his life as though his old family had never existed. After looking after him, Maggie sends him away. And he goes away. The rising action begins when one of the daughters (Wood) is kidnapped by outlaw former Indian guides for the army. Maggie's youngest daughter Dot (Boyd) hid during the attack on them and the two ranch hands as they were on a cattle trip. She escaped from harm, but witnessed some of the horrorible deaths. Maggie finds Dot and the prior terror is explained to her. It appears a man with a hood took the eldest daughter, Lily. Maggie sets out to find her daughter with Dot in tow. They run into Samuel in a nearby town where they also find that the local law enforcement isn't going to do much to help them. Soon, the ragtag group of unlikely adventurers are out chasing the Indians. Action ensues. People grow. And you can predict who lives and who dies halfway through. Yee-haw. The trailer promises suspense and a little goosebump production, but it ends up offering none of that. It's a by the numbers attempt at the genre. While the characters and directing aren't horrorible, they do not offer anything to distinguish themselves from any other western that you've seen. Howard's direction is average at best, and there's little evidence of greatness he's shown in past films. There are some quality moments, but others fall flat. Speaking of falling flat, the Indian mysticism does just that. All the voodoo mumbo jumbo makes up way too much of the film. It never works with it. It only comes off as hokey, something westerns have to try extra hard to overcome. Tommy Lee Jones appears to be on loveable gruff auto-pilot. There's no range required to play his role. His is good at times, but, like everything else in the film, there's no consistency. He's either good or average. Average or bad. Cate Blachett does show a surprising grasp of the western accent many overdo. Still, she too tends to overact at times. Her feistiness did win me over eventually, but if I never see her moaning feverishly ever again, I'd die a happy reviewer. The film isn't a complete waste of time. It's just that you can receive the same quality from just about any other western. And there's certainly better westerns and films to be found. If the plot sounds good to you, you'll probably at least enjoy the movie. But don't expect much more than what I laid out for you. There isn't a lot more than the gruff and the feisty.